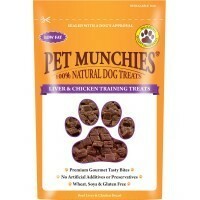 Pet Munchies Liver & Chicken Training Treats are 100% natural gourmet tasty bites, made from the best quality real beef liver and chicken breast meat. Delicately baked in their own natural juices to enhance the flavour, the highly palatable treats are perfect as a training aid, a reward or simply as a tasty treat. Beef Liver min 36 %, Chicken Breast in 35%, Albumen, Glycerin, Starch, Salt.